Please join us in congratulating the Spring 2019 winners of the Jump ARCHES grants announced jointly by the University of Illinois College of Engineering and OSF HealthCare. The eleven awards will share nearly $810,600 of total funding. Jump Trading Simulation and Education Center (jumpsimulation.org) and the University of Illinois Health Care Engineering Systems Center (healtheng.illinois.edu) are pleased to announce the Jump ARCHES summer internship opportunity in Medical Simulation and Virtual Reality. This internship, located at the University of Illinois Urbana-Champaign, is a full time summer internship. The Military Service Knowledge Collaborative is issuing a Call for Proposals! 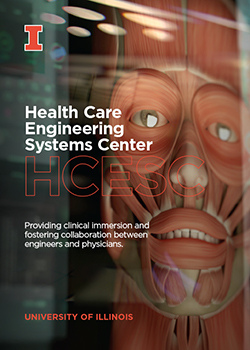 The Health Care Engineering Systems Center has released our Annual Report for 2017-2018. If you are interested in collaborating with the Jump Simulation team, please go to the Contact page and complete the form. Please join us in listening to the Podcast from the successful 2nd Illinois Health Data Analytics Summit. Many thanks to Mike Koon from the College of Engineering for his great work. We want to thank the UIUC College of Engineering for writing a great article about our research!